New Quick Settings design, Notifications dot, and September security patch. Download OxygenOS 5.0 for OnePlus 3 and OnePlus 3T from below. 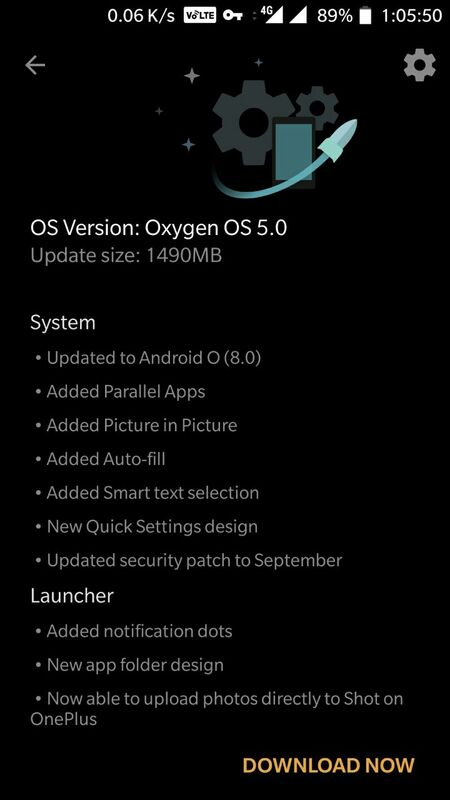 The update is rolling out via OTA (over-the-air) and many users already getting OxygenOS 5.0 for OnePlus 3T. The update is incremental and rolls out in phase wise manner. You can wait for the OTA updates, or you can Update Oneplus 3/3T to OxygenOS 5.0 Oreo manually with below method. Download OxygenOS 5.0 for OnePlus 3 and OnePlus 3T from below. 4) Download the OxygenOS 5.0 for OnePlus 3 and OnePlus 3T from above Copy ROM to a folder where adb installed. 1) Download OxygenOS 5.0 OTA zip file from above and save it on your internal phone memory. 6) Select the zip file, and it will Install OxygenOS 5.0 OTA update file on your OnePlus 3/3T.